Postcard from Ruggero Bacci, written in Italian, to his son Aldo Bacci, February 23, 1941. 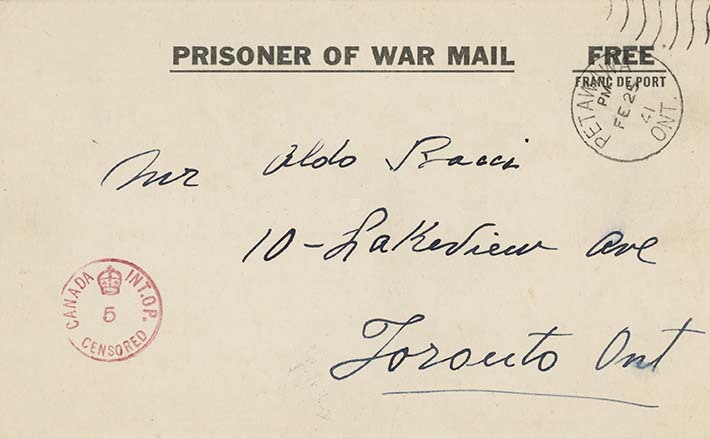 Internee Bacci writes to his eldest son, Aldo, that he is pleased to hear that he is well. He notes that he received the photographs that were sent previously. He is surprised at how much his youngest son Alfo has grown. He also warns Aldo that the next few months will bring grave times and "tremendous storms". He advises his family to remain safely at home. Due to his father's internment, Aldo was forced to quit high school to help support the family. Bacci's wife Erminia (Minnie) suffered a serious nervous breakdown and was hospitalized at length. When his father was released and returned home, Aldo received notice that he was conscripted into the Canadian Army; however, he did not serve overseas.